The 3rd WBC Women's Convention and WBC Asian Summit could not be imagined without a thrilling boxing show, and that is precisely what fans and attendees to the convention will get November 18 at the Philippine International Convention Center (PICC) in Pasay, Metro Manila, Philippines; an exciting fighting event that promises total action. Organized by Filipino Award-Winning Promoter Brico Santig of Highland Boxing, the show's main event features the 12-round rumble of unbeaten world-ranked Uzbekistan warrior Azizbek Abdugofurov (11-0, 4 KO's) defending his WBC Silver Super Middleweight Title against Middle Kingdom power-puncher Wuzhati Nuerlang (11-1, 9 KO's), an exciting title battle that can not be missed. The co-main event showcases thrilling fighting women. Lady boxer Phannaluk Kongsang of Khon Kaen, Thailand, comes back to the Philippines to battle undefeated warrior-girl Urvashi Singh (3-0, 3 KO's) of the Team Roshan Boxing Academy in New Delhi, India, for the vacant WBC Asian Female 118 pound crown. The two women - both 23 - can't wait to be on top of the ring getting at each other, a test of who is the superior warrior. The Thai Phannaluk of the Highland Boxing Stable is the taller of the two woman. Phannaluk is slick, conservative in her boxing and fights from a distance, using her long left jab to keep opponents at bay. Meanwhile Urvashi is shorter, exciting and comes forward throwing hard blows to the head and body, winning all her combats by way of knock out. 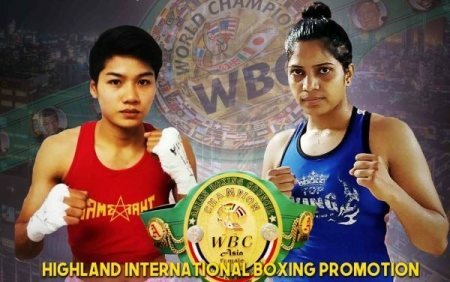 Trained by renown Indian pro boxing coach Roshan, Urvashi - born from the City of Kanpur in Northern India, now living in New Delhi - is the very first Indian lady boxer to fight for a WBC Asian Title, an honor that she shares with her father Niranjan, mom Chandravati and young sibblings Brahm, Reinu, Minu and Anjali. 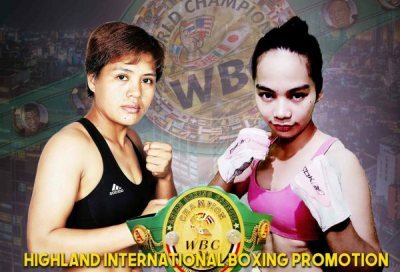 In another women's WBC title fight, Filipinas battling girls Gretel de Paz (5-4, 2 KO's) of Naval, Biliran, and Carleans Rivas (6-6-3, 0 KO's) of Angono, Rizal, will climb the square ring for the vacant WBC Asian Female Flyweight strap, a rumble that promises fireworks. The experienced Carleans, 29, fights out of the popular Highland Boxing Stable, while Gretel, 25, belongs to the Cucoy Elorde Boxing Team. Both women have been Filipino National belt-holders, and on November 18 they will go for the WBC Asian strap. What warrior girl will come out victorious? Also, 19 year-old Filipino Jr. Flyweight fighter Jonathan Almacen (4-2-2, 1 KO) of Muntinlupa in Metro Manila battles tough hot red Middle Kingdom boxer Xiang Li (李翔) for the vacant WBC Asian Silver 108 pound belt. It's the first time that the 20 year-old Xiang Li (5-1-1, 2 KO's fights outside of his native China, and the first time that the the Pinoy Almacen battles a foreign fighter. Who will win? Moreover, in thrilling Women's Muay Thai action, Filipina Rudzma Abubakar - who earlier this year represented the Philippines at the Muay Thai World Championships in Cancun, Mexico - will engage in battle against equally tough Saskia Fagyan of the Cordillera Region for the prestigious Philippines National Muay Thai Youth Championship. Both 18 year-old women are awesome dangerous fighters. Rudzma has been 2016 World Championships Gold medalist and 2017 Youth World Championships Silver Medalist; while the beautiful Saskia has been All-Women's Muay Thai Festival Gold Medalist. The two girls are experienced, strong, fearsome combat ladies in top shape aiming for victory November 18, and you have to be there. 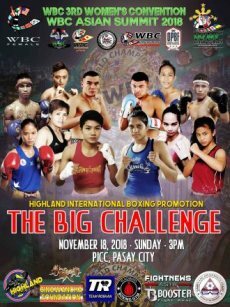 "The Big Challenge" on November 18 at the iconic Philippine International Convention Center (PICC) in Pasay, Metro Manila, is a production of Filipino promoter Brico Santig of Highland Boxing Team in cooperation with the Philippine's Games and Amusement Board and the WBC Asian Boxing Council. Fights start at 3 PM. The author Carlos Costa is a Panama-born veteran man of boxing living permanent in Cebu, Philippines. He will attend this boxing event in Manila. Carlos can be reached by email: Carlos512@hotmail.com and Whatsapp: +639184538152.